PerkinElmer has announced the launch of its Lamina multilabel slide scanner, a high throughput imaging system designed to help research pathologists to more easily study protein expression and the relationships between disease markers in formalin-fixed, paraffin-embedded (FFPE) tissue sections. According to PerkinElmer, Lamina multilabel slide scanner’s advanced digital pathology capabilities support deeper understanding of diseases and development of more effective therapies and treatments. The Lamina scanner is configured to meet the needs of a larger research facility. The device features high-speed brightfield and fluorescence imaging modalities along with the company’s proprietary Autofluorescence Reduction Technology. It is designed to reduce interference from autofluorescence – an unwanted by-product of tissue fixation – and fluorophore cross-talk, in which the signal from one fluorophore bleeds into multiple channels. Both of these effects obscure real signals, which can result in an incorrect assessment of a slide. 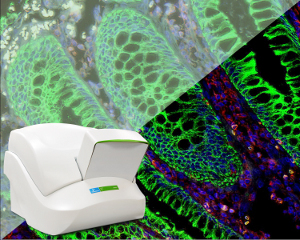 The Lamina scanner delivers these improvements in real-time during whole-slide scanning, enabling clearer visualization of protein biomarker expression in fluorescently labeled tissues. As a result, the Lamina scanner enables users to obtain more accurate information from histological specimens. According to PerkinElmer, the new device produces exceptional-quality, digital, whole-slide images of hematoxylin and eosin, immunohistochemistry and immunofluorescence-labeled tissue sections and tissue microarrays, which can be stored and shared electronically without degradation. PerkinElmer Diagnostics / Life Sciences and Technology president Jim Corbett noted as a leading provider of imaging platforms for disease research, the company routinely engages research pathologists globally so it can better understand the complexities of studying disease markers and develop innovative solutions to meet their needs. "The Lamina scanner can help research pathologists more effectively interpret their images by automating workflows and providing clearer and faster results. These advanced digital pathology capabilities can help lead to a better understanding of disease," Corbett added. PerkinElmer has announced the launch of its Lamina multilabel slide scanner at the USCAP 2014 Annual Meeting. PerkinElmer launches Lamina multilabel slide scanner. Photo: Courtesy of BusinessWire/ PerkinElmer, Inc.